Birds and blooms are our harbingers of spring. This month, head to an avian festival or garden fair to celebrate their welcome return. Explore Sylvan Heights Bird Park during this annual Earth Day celebration, which is part of the North Carolina Science Festival. Local museums, colleges, and environmental groups will have educational booths and hands-on science activities set up throughout the park. 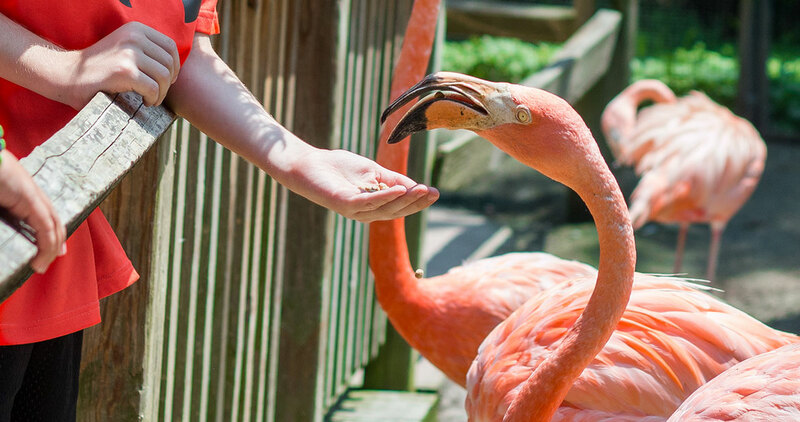 Learn about fossils, meet live animals, and make crafts — all while getting up close and personal with more than 2,000 birds. Rise with the sun to celebrate Easter morning through music and Scripture during this 63rd annual nondenominational service on the shore of Lake Lure. See the bold, colorful paintings of Hickory artist Derrick Chalfant on two floors of Morganton City Hall during this two-month exhibition. Enjoy an evening spent listening to Western Carolina University associate professor Beth Huber interview Pulitzer Prize-winning playwright Tony Kushner at the Bardo Arts Center. Spend the weekend celebrating Surry County’s musical heritage at Dobson Community College’s lively two-day festival filled with square dancing, folk music, and contests for musicians. If you catch a trout in a Watauga County body of water during this event and think its size just might be worthy of a prize, bring it to the Trout Derby in Blowing Rock and have the professionals decide. There’s no cost to participate. The Grovewood Gallery will host “Spring Awakening,” an art exhibition benefiting the nonprofit Arts for Life, which engages pediatric patients and their families in arts education and opportunities. Live music and kids’ crafts will be part of the opening reception sponsored by The Hop Ice Cream Café. Violinists Wil Baptiste and Kev Marcus use their unique blend of classical, hip-hop, rock, and pop music to create a high-energy sound. Backed onstage by drummer Nat Stokes and DJ SPS, Black Violin will put on a powerful show at the Schaefer Center for the Performing Arts. Take a winery tour around Henderson County and sample local wines and artisan hard ciders from seven participating wineries. Tastings, hikes, live music, and helicopter tours (available by reservation) ensure that the weekend will be filled with plenty to do, see, and taste. Featuring a lineup of dozens of folk, bluegrass, and indie artists — including Rhiannon Giddens, Steep Canyon Rangers, Mandolin Orange, and many more — this four-day music festival will be a jam session to remember. In addition to performances, there are activities to keep the whole family happy and busy, including backstage tours, nature walks, and a jam camp. Let yourself be whisked away to the world of Jane Austen during this performance at the Hart Theatre. Follow the trials and adventures of the Dashwood sisters in this new adaptation of the beloved classic novel. Hosted by the Mountain Gateway Museum, Pioneer Day welcomes visitors to celebrate and participate in the area’s mountain heritage. The event features vendors, regional music in an amphitheater, and craft demonstrations where you can turn a clay pot or learn the basics of blacksmithing. This 21st annual spring festival is a celebration of the season. Take part in a 5K run, let younger members of the family show off their skills in the children’s talent show, and enjoy performances by bluegrass and country artists on multiple stages. Taught by professional photographer Chuck Hill, this two-day workshop will help students appreciate and capture the natural beauty of Chimney Rock from sunrise to sunset, focusing on scenic photography and panoramas. Grab a seat at the UNC Center for Dramatic Arts to see this original production, which tells the story of a small mill town in North Carolina as it goes through tough times and, ultimately, reaches the light at the end of the tunnel. Journey back to the ancient days of the Greek playwright Sophocles for a tragic tale involving a brave heroine, a dysfunctional royal family, and pride that comes at a very high cost. Artists use fire to forge blown glass, clay pottery, and metal sculptures during live demonstrations at this annual event. Spend your Saturday watching the professionals, munching on food truck offerings, and visiting the on-site beer garden. Words have power: This competition, which features performers from across the country, will combine storytelling, emotion, and entertainment. Admission is $10, and dinner is available for purchase. Carrboro encourages community by closing Weaver Street to traffic and inviting people to reclaim the public space. Take part in activities such as rock climbing, yoga, cycling, and more. Baked or fried, blackened or grilled: However you like your fish, join esteemed food writer and Raleigh native Debbie Moose as she unveils her new cookbook, Carolina Catch, at Quail Ridge Books. Browse a selection of potted succulents, herbal teas, homemade soaps, and wildflower seeds at the Cabarrus County Arena during this annual event hosted by the county’s assembly of Master Gardener volunteers. Play early 20th-century games, watch woodworking, and dance around the maypole. Kids can make toys and stationery; adults can tour the historic Reid House and see a variety of antique cars. Jim Quick & Coastline, The Embers, Band of Oz, and Chairmen of the Board will perform at this fifth annual beach music celebration. Bring your dancing shoes, then enjoy offerings from food trucks when it’s time to rest your feet. Want to exchange that unused rake in your garage for blooming perennial flowers in your empty window boxes? Head over to the colorful Weymouth Center gardens to take part in the annual spring sale. Start humming “My Favorite Things” and picturing yourself twirling on the Austrian hilltops, because this classic production is coming to the Durham Performing Arts Center. Enjoy live music, historical reenactors, and more at this 13th annual fundraiser hosted by the Moore County Historical Association, which helps maintain the historic Bryant House and McLendon Cabin. Hear wind, percussion, and string instruments at this concert by the Fayetteville Symphony Orchestra at Seabrook Auditorium. Look forward to signature pieces, including Aaron Copland’s Appalachian Spring. Browse more than 50,000 books at this annual fund-raising sale at St. Francis Episcopal Church. Find everything from fiction to cookbooks to coffee-table hardbacks. Celebrate the return of migratory songbirds during this annual festival at Blue Jay Point Community Park. Enjoy bird-related games, crafts, story time, bird hikes for adults and kids, learning stations, and more. This annual festival in Bond Park celebrates the arts and crafts community. It will feature more than 170 artists, entertainment on four stages, and tasty food. Embrace spring with a tour of 15 private gardens, including a rooftop garden, farm-to-table garden, a classic revival garden and others in a variety of different neighborhoods across the city. Proceeds from this biennial event are used to provide grants for community beautification, restoration, and conservation projects. See how crops are grown, how barn animals are raised, how fresh ingredients are made into food and beer, and much more when the Carolina Farm Stewardship Association and Weaver Street Market host this 23rd annual self-guided tour of scenic and sustainable farms in Orange, Chatham, Alamance, and Person Counties. Enjoy artwork, artist demonstrations, and live music at various downtown locations during this monthly event. Enjoy a high-energy performance at Arts of the Albemarle featuring this acoustic quintet. Group members play guitar, violin, standup bass, percussion, and keyboard — plus an accordion. During this 26th annual event, the grounds of Poplar Grove Plantation will be filled with locally grown plants, garden art, herbal and all-natural products, artisan crafts, and local foods. The stables will also be open for self-guided tours, and kids can enjoy animal meet-and-greets. One of the most celebrated young international quartets today, this group has been recognized by BBC Radio 3 as “New Generation Artists.” They will perform at UNC-Wilmington’s Beckwith Recital Hall. This chamber music group was founded in 1974 as the resident brass quintet at UNC Greensboro. Today, several of the musicians are professors at Brandon University in Manitoba, Canada, but the group remains affiliated with UNCG. They’ll perform at the Turnage Theater. See the tale as old as time at College of the Albemarle’s Performing Arts Center. Enjoy art, music, and a garden party, all to benefit the 1758 Cupola House, a National Historic Landmark. Take tours of beautiful gardens filled with spring blooms while artists interpret the surroundings into works of art. Enjoy a concert at the Old Theater featuring this Grammy Award-winning classical group, which has been described as “something extraordinary” by The New York Times. This annual event, held at the North Carolina Cooperative Extension Currituck County Center, will feature plants, vendors, educational booths, gardening demonstrations, plant sales, baked goods, and a kids’ area. Enjoy reenactments and performances by pirate troupe Motley Tones when pirates invade the city during this annual festival on Mariners’ Wharf. There will even be a special appearance by Blackbeard. Admire the North Carolina coast during a 5K, 10K, half marathon, or one-mile race. The course features salt marshes, beautiful beaches, footbridges, and the Oak Island Lighthouse. Take part in five days of tastings, seminars, dinners, live and silent auctions, and more at this 14th annual festival on the Crystal Coast. Head somewhere over the rainbow at the Paramount Theatre, where the classic movie will be brought to the stage with familiar characters, colorful costumes, and classic songs. Enjoy a performance by this musical comedy trio, made up of classically trained singers, at the Carolina Civic Center Historic Theater. Think Duck Dynasty goes to Carnegie Hall. At this second annual event, TinyHouseNC welcomes tiny-house enthusiasts to see a variety of tiny homes and enjoy food and vendors on South Central Avenue downtown. This garden show, “Through a Garden Gate,” will feature plant sales, locally made crafts, a kids’ corner, an “Ask a Master Gardener” booth, baked goods, educational speakers, and more. Lunch will be available for purchase. Choose from a 5K or 10K on the 28th, or a half marathon on the 29th, and run through history: You’ll pass the Ocracoke Lighthouse, the British cemetery, and the harbor during this annual race. Enjoy post-run parties after both events; beverages will be provided by 1718 Brewery.